When a recipe calls for egg whites and not yolks, what on earth can you do with the left-over yolks? Read on to find out! Eggs are incredibly versatile and besides making a complete meal in themselves, when eaten whole, they can also be used as part of the ingredients of many other savoury and sweet dishes. Eggs can also be separated into the component parts of yolk and white where only one part of the egg is used in the recipe. The egg’s yolk is the deep yellow, highly nutritious, slightly viscous, centre of an egg. It makes up approximately 30% of the total weight of the egg and contains fats, minerals and vitamins. Egg yolks will actually keep relatively happily in the fridge for 2 or 3 days; however they tend to congeal or dry out. To prevent this happening, cover the yolk with a small amount of water and drain before using. Yolks can also be frozen but should be thawed really well before use. Nevertheless, spare egg yolks are much better used fresh, and as such it is wise to have a few recipes up your sleeve for when you need them. 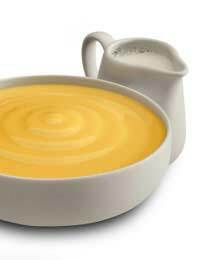 Real custard sauce (as opposed to the instant custard powder variety) is a real treat and a wonderful way to use up left-over egg yolks. For a delicious accompaniment to fruit puddings and sponges, use the following basic recipe. Gently heat 300ml (half a pint) of fresh milk in a pan, flavoured with a vanilla pod. When almost at boiling point, remove from the heat and leave the vanilla to infuse in the warm milk for about 15 minutes. Meanwhile beat 4 egg yolks together with 25g (1oz) of sugar until thick and creamy. Take out the vanilla pod from the milk and carefully pour onto the egg and sugar mixture. Then, cook slowly in a heavy saucepan until smooth and thickened. Serve hot or cold. Simply boil together 5ml (a teaspoon) of lemon juice, 5ml of white wine vinegar, 15ml (a tablespoon) of water with 3 white peppercorns and half a bay leaf for flavour. When the liquid has reduced by about half, set aside to cool and then strain out the pepper and remove the bay leaf. Next, place 4 egg yolks and the vinegar reduction into a basin fitted over a pan of simmering water (or use a double boiler if available). Without allowing the water underneath to boil, whisk the mixture until foamy and thick in appearance. Finally, add 225 (8oz) of butter a tiny amount at a time and continue incorporating until fully absorbed. Season and serve. If you have just a single egg-yolk to use up, another good use is to prepare home-made mayonnaise. To make, mix egg yolks and half a teaspoon of English mustard together and then taking 150ml of salad oil, whisk about half into the mixture, drop by drop. This stage must be done slowly or the mixture will curdle. Next, whisk in half a tablespoon of lemon juice and then carry on with the remaining oil. Add a tablespoon of vinegar (such as white wine or cider), half a teaspoon of sugar and seasoning to taste. There are lots of different recipes for mayonnaise, and other flavourings can of course be added, but this is a classic version. Small amount of milk if needed for moisture. Make a mound of flour directly on your kitchen surface, a wooden board or marble pastry slab and make a ‘well’ in the centre with your hand. Then pour the egg into the middle of the well, so that the flour is surrounding the eggs and holding in the liquid. Begin to mix with a knife or a fork, gradually incorporating the surrounding flour until the mixture begins to resemble dough, and then work with your hands, kneading well. If you have a pasta machine, then feed the dough through it to the desired thickness and shape, but otherwise, roll out the dough and roll as thinly as possible, dusting the pasta as you go to stop it sticking. Then cook in the normal way. There are many other ways for using up left-over yolks, including rich pastry (just add an extra yolk to the mix), for glazing pastry (it gives a lovely colour), as a thickener (yolks can be added to mixtures which need extra thickening or setting), for richness (some cakes can be made with just yolks), as a binder (for things such as stuffing mixes or home-made burgers) and so on. Whatever you do, don’t just chuck them! I was looking for recipes for salmon fishcakes,and I found a variety of easy to make fishcakes,which are just what I wanted,as i am not exactly Rick Stein.It also gave you several ways to make them and with different ingredients.I am more than happy with the results.Thank you.